Banks face increased competition from large financial institutions, and digital-first consumers expect products that offer convenience, transparency and speed. The key to banks winning business customers in this new lending environment? Real-time lending. Real-time lending is the automated credit decisioning and funding of loans online, often instantaneously. The backbone of real-time lending is technology that allows banks to digitize their credit policies and provide customers with a convenient online application and the value of immediate account funding. Real-time lending transforms traditional execution of loans by leveraging intelligent automation and data science. What once took weeks of manual front-office selling and back-office underwriting resources can now occur in minutes. From generating greater profitability to attracting new customers for ongoing growth, the benefits of real-time lending for banks are strategic and compelling across the business and stakeholders. With traditional lending, the same resources and costs are required to close a $50K loan as a $500K loan. Real-time lending both removes costs and increases pricing, transforming small business lending into a lucrative growth driver. Manual lending takes weeks of inefficient and costly front- and back-office resources. 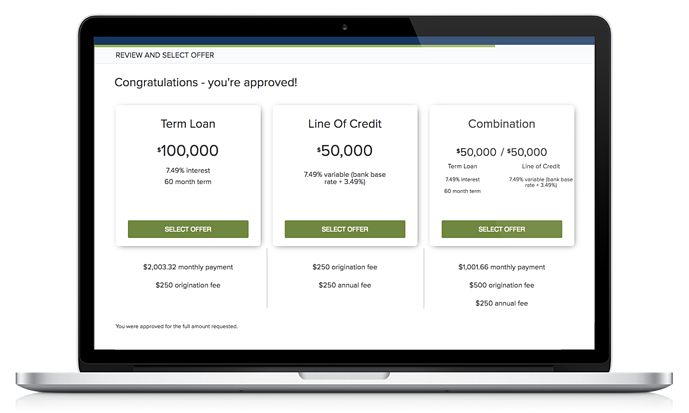 Real-time lending executes credit policies in minutes—all without sacrificing a bank’s credit standards. In addition, banks using real-time lending have proven they can increase pricing based on the convenience it offers to customers. Digital access is now table-stakes for banks, and on-demand services are transforming every aspect of business and consumer life. Real-time lending allows businesses to secure financing online anywhere, anytime. Millennials and GenX, the largest lifetime value segments for banks, grew up with the Internet and increasingly expect services on-demand. Real-time lending attracts these business owners, establishing a foundation as long-term customers. Real-time lending ensures uniform credit decisioning without inconsistency or subjectivity, all while providing credit officers the flexibility to price by segment and make changes in shifting economic environments. Real-time lending powers more than just online applications. From in-branch and over-the-phone conversations to remote visits, bankers can walk businesses through the online application process to speed loan funding to minutes. Business lending has become increasingly crowded with alternative financing options. Local banks can offer defensible differentiation by coupling advantages in their community relationships and high satisfaction scores with real-time lending’s convenience. "[We presented] our small business customers with the opportunity to obtain a loan of up to $100,000 in as little as five minutes from application to funding—completely digitally—representing the easiest, fastest, and most transparent borrowing experience offered by any bank in the United States."